If you’ve followed us for a while, you’ve seen that our mission has suffered several major setbacks this year. Thanks to you, our listeners never noticed, as our signal of inspiration, education and companionship has continued, and as popular as ever, reaching almost every household for 100,000 square miles. Christmas Day, as every day, you and those you love will be in our most heartfelt prayers. We thank you, we honor you, and we pray that Our Heavenly Father blesses you abundantly. May you enjoy a wonderful Christmas! PROCLAIMING HIS BIRTH: (left) KNOM volunteer David Dodman checks out the KNOM Christmas Star, which has called attention to Jesus’ birth every December since 1971. Today’s five-foot star rests atop the mission studio’s 80-foot microwave tower. 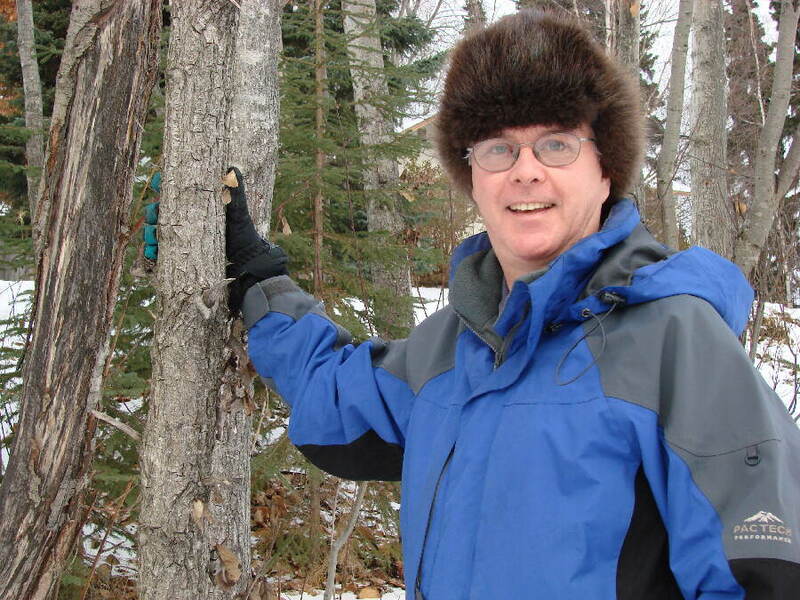 Throughout the years, several of its predecessors have been ripped apart by western Alaska’s harsh winter winds. This sturdy version, made of steel conduit and lighted by rope lamps, such as you’d see in a movie theater, was designed and built by former KNOM chief engineer Les Brown in autumn 1997. (Left) Here's a photo taken at the same time, without a flash, which is more what you would see with your own eyes as morning approaches noon in December. 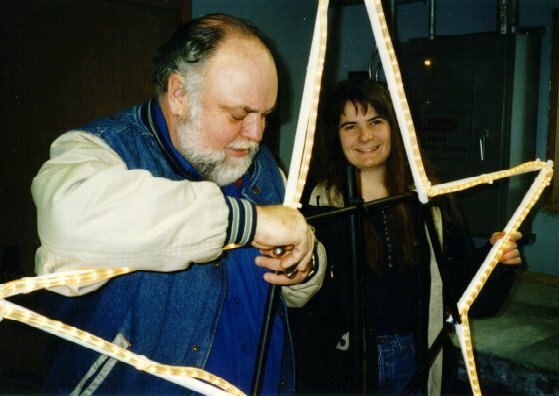 (Left) In November 1997, Les puts the finishing touches on the new star, while volunteer Connie Fessel looks on. TRIMMING THE TREE: As Christmas approaches, the KNOM signal lights up with hymns, carols and special Christmas inspirational spots, and daily, you’ll hear one of the many Christmas stories which volunteers have produced over the years. To us, it feels like trimming a Christmas tree, filling the airwaves, rejoicing to the remembrance of Jesus’ birth. 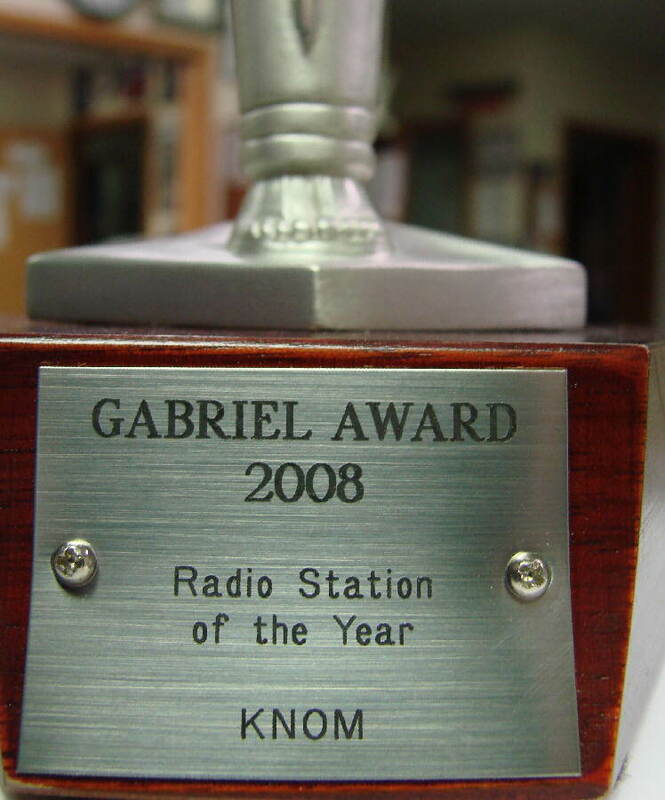 IF YOU’RE NEW TO US: KNOM is the oldest and most award-winning Catholic radio station in the United States, serving remote Alaska Native villages since 1971, supported entirely by donations. CHRISTMAS INSPIRATIONAL SPOT: The wise men followed the light that brought them to Bethlehem. We, too, need the special light of Jesus to show us the way to a daybreak that will never end. The light that filled the sky of Palestine two thousand years ago already fills the world today. We just have to open our eyes to see that light…Jesus, the Light of the world. CHRISTMAS INSPIRATIONAL SPOT: Since Jesus was born in a cold cave, in poverty and rejection, I’ve been thinking of a special gift I could give Him. I could go throughout the entire Christmas season, and maybe the rest of my life, without complaining. I could live my life thanking Him for all of my blessings, and looking for blessings where I might least expect to find them. 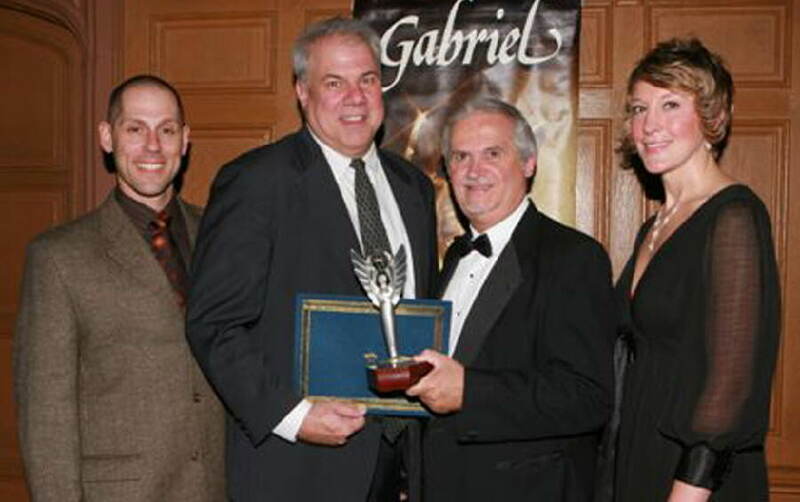 NEW ANGEL: (left) KNOM accepts the 2008 Gabriel Radio Station of the Year Award in Los Angeles. From left to right, news director Paul Korchin, general manager Ric Schmidt, Frank Morock of the Catholic Academy for Communica-tion Arts Professionals, and program director Kelly Brabec. We have been honored by it 17 times, and this was the 13th in a row. 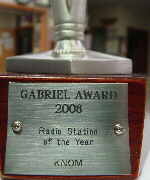 (Left) The inscription on KNOM's 2008 Gabriel Award. Later, in November, the Alaska Broadcasters Association honored KNOM for Best Breaking News Coverage and Best Public Affairs Program. As you know, we don’t labor in Nome to win awards, but they do feel good, don’t they? In our minds, this award honors you more than it does us, as you are our greatest strength. Thank you for making our work possible! 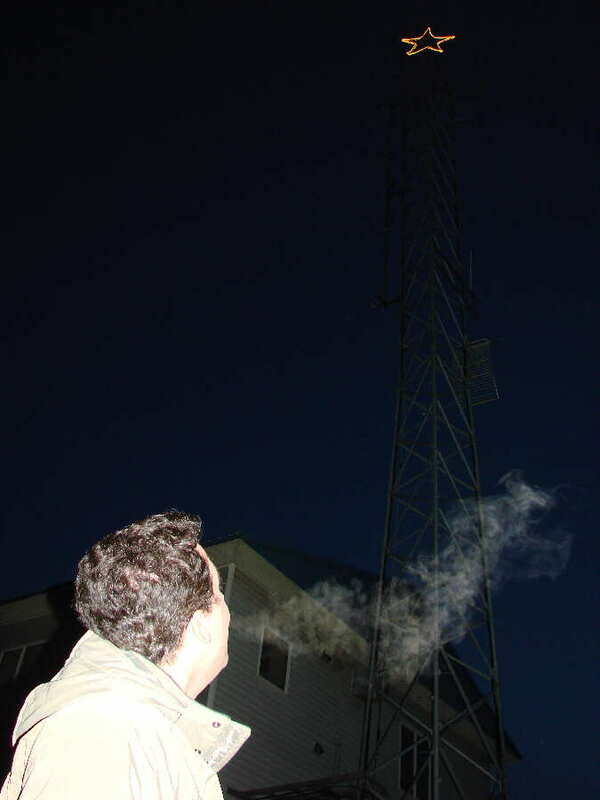 TO THE RESCUE: Nome police chief Paul Burke was breathless when he ran into the KNOM studio. An 8-year-old girl was missing. A KNOM listener remembered seeing her with relatives, and the child was located within fifty minutes. Days later, police found a 4-year-old girl wandering alone. It turns out that the child left the house while her aunt was in the bathroom. Following the KNOM announcement, girl and aunt were united within eight minutes. LEGACY: Many of our mission’s friends, including staff members, have remembered KNOM in their wills. For most of us, this gift will be larger than any we could make in our lifetimes, providing a legacy that will help thousands of God’s children for years to come. CHRISTMAS INSPIRATIONAL SPOT: On Christmas Day, how many people in the world will be singing hymns, and how many will be crying? Lord, help me to be generous, and reach out to help at least one person this Christmas. That will make for one more voice singing in Your choir. CHRISTMAS INSPIRATIONAL SPOT: Born in a stable, a choice He made. Simplicity and poverty. A choice no temporal power or influence would have ever suggested. A choice — God became man in a way no one would have ever guessed. Do you suppose He was trying to tell us something? 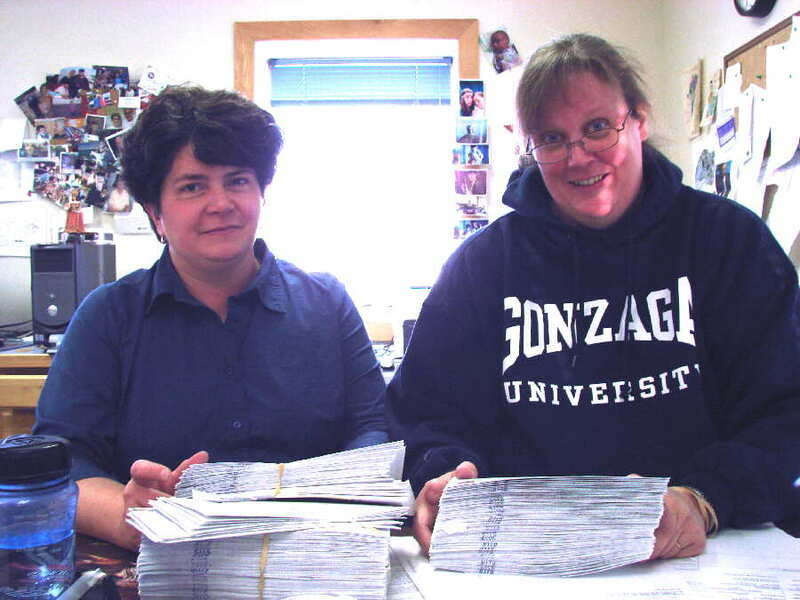 IF YOU GIVE OR WRITE TO OUR MISSION, chances are your envelope will be opened by either office assistant Betsy Brennan, at left, or by business manager Lynette Schmidt, at right. Betsy was a full time KNOM volunteer from 1988 to 1990; Lynette volunteered from 1982 to 1985. Each of them deeply cares for the work of the KNOM mission, and for the kind people who support it with finances and prayers. You can see that the service which KNOM provides is made possible by many, many good people like you, working together. Thank you! Both General manager Ric Schmidt and financial officer Tom Busch are past presidents of Nome’s Rotary club and long time board members. Both have served as two-term past presidents of the Alaska Broadcasters Association. Together, they have led the state trade association throughout 10% of its history. Today, Ric is vice chair of Employer Support of the Guard and Reserve for the western Alaska region. Tom is secretary for the Rotary International district that covers Alaska, the Yukon Territory as well as Russia east of the Ural Mountains. He is a commissioner on the Alaska Public Broadcasting Commission, and he and wife Florence regularly prepare dinner for a large Anchorage women’s shelter. Program director Kelly Brabec is captain of the KNOM-sponsored city league volleyball team. Volunteer Dave Dodman continues as cantor for St. Joseph Parish. Betsy Brennan is an “Arctic Pinky,” part of a group that supports victims of breast cancer. Recently, she, Ric, and KNOM volunteers Danielle Sylvester and Laura Davis took part in a walk that raised funds for a chemotherapy chair for Nome’s hospital. Danielle, meanwhile, is studying to become an Emergency Medical Technician for Nome’s volunteer ambulance service. Over the years, dozens of KNOMers have served as volunteer firefighters. They have donated their time to organizations such as Nome's Arts Council, its preschool, and its library association, among a few that come to mind, often chairing the groups. OUT ON A LIMB: Growing up in suburban Philadelphia, KNOM financial officer Tom Busch spent a lot of time playing in the woods. THIRTY YEARS AGO: There’s even more snow than usual in December 1978, and just before Christmas, all of Nome’s streets are one-way as crews battle to keep up with the accumulation. TEN YEARS AGO: In December 1998, KNOM receives an odd phone call. Is someone jumping through snowdrifts at the Nome cemetery with a roaring chainsaw? It seems that a musk ox has claimed the graveyard as home. Concerned that the usual technique to frighten off game, firing rubber bullets, might damage some of the grave markers, Fish and Game biologist Charlie Lean chases the huge animal with the only portable noisemaker he can think of. It doesn’t work, and the huge stubborn beast hangs out at the cemetery for another few weeks. 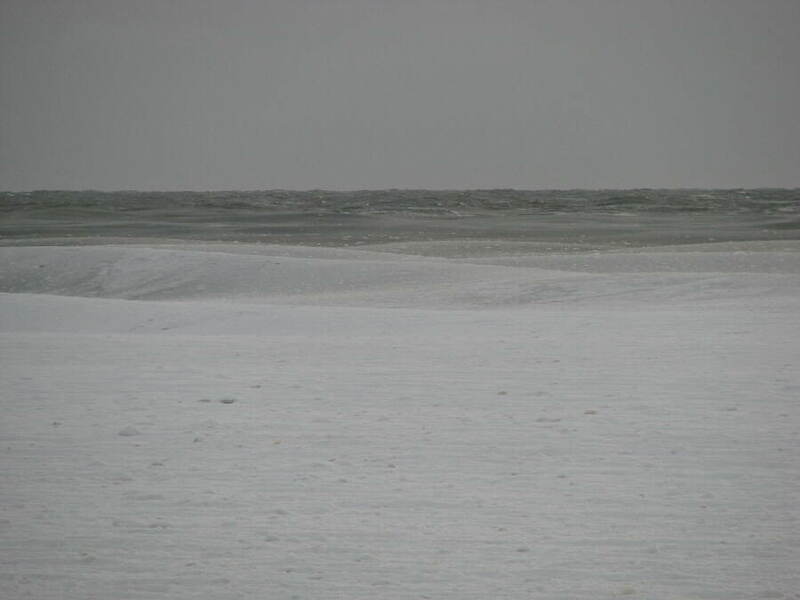 BIG SLUSH: (left) With a series of strong winds, the Bering Sea is taking a bit longer to freeze than usual. In the middle of the image, about a half-mile from shore, ten-foot-high mounds of slush roll in, pushed by waves from farther out. You might be surprised to learn that this is actually a color picture! Spots range from ten seconds to a minute long — we sprinkle them among music and news, alternating with inspirational spots. 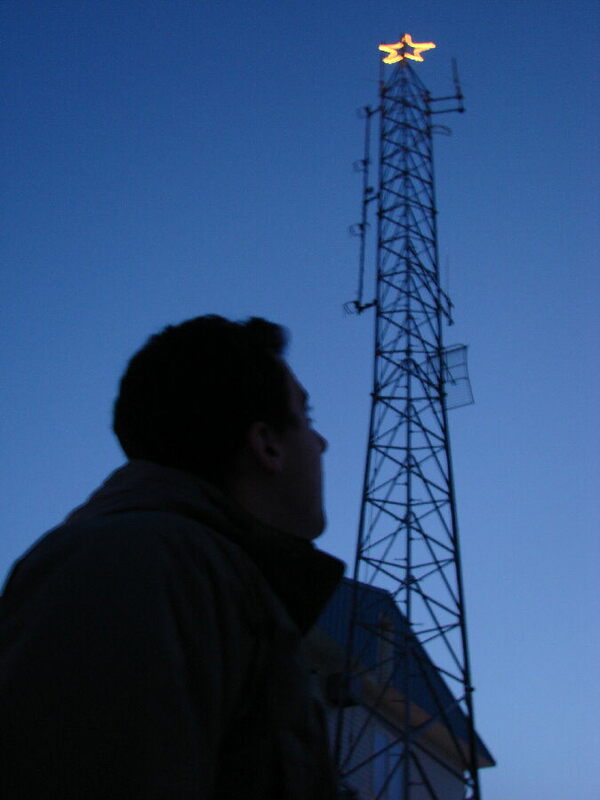 By the end of December, with your help, we will have broadcast about 68,000 spots during 2008. THANK YOU, THANK YOU! We thank God for kind friends like you, and we pray that He is a constant source of strength and joy in your life. May you and all of your loved ones have a merry and blessed Christmas. God bless you!